I love food that transports you somewhere else. I especially love food that makes you feel like you’re on vacation — especially if said vacation is someplace tropical. That’s exactly what this week’s winner does. Grilled Shrimp Tostadas with Lime will make you feel like you are sitting beachside under a palapa in Mexico while sipping some cool, umbrella-laden cocktail. In truth, I was sitting at my dinner table with a glass of wine on a crazy-hot late September Chicago night. But hey, I can dream… can’t I? Grilled Shrimp Tostadas with Lime comes from Cooking Light Magazine and as you might suspect is quite light and healthy. It’s also a very quick, easy recipe that comes together in no time which allows you to take your imaginary tropical vacation any day you like — no passport required! To prepare shrimp, combine shrimp, garlic powder, cumin, and 1/4 tsp salt in the bowl. Let stand 10 minutes. Heat a grill pan over medium-high heat. Coat pan with cooking spray. Add shrimp to pan; grill 2 minutes on each side. 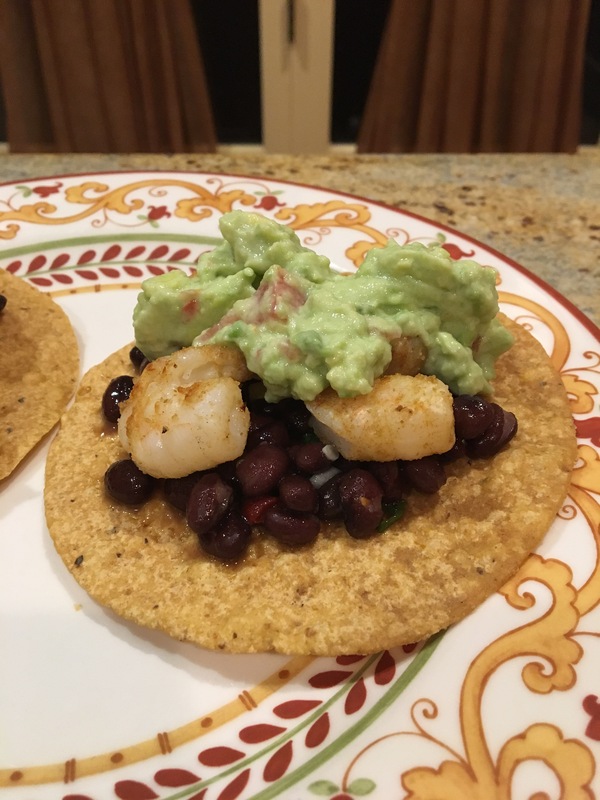 Top each tostada with 1/4 cup bean mixture, 3 shrimp, and 1 Tbsp avocado mixture. Serve with lime wedges. As much as I believe the saying “you eat with your eyes first”, there are times when you can forgo looks and dive right into a vat of tastiness, regardless of its outward appearance. You just know it’s going to be good. Such is the case with Stuffed Poblanos. 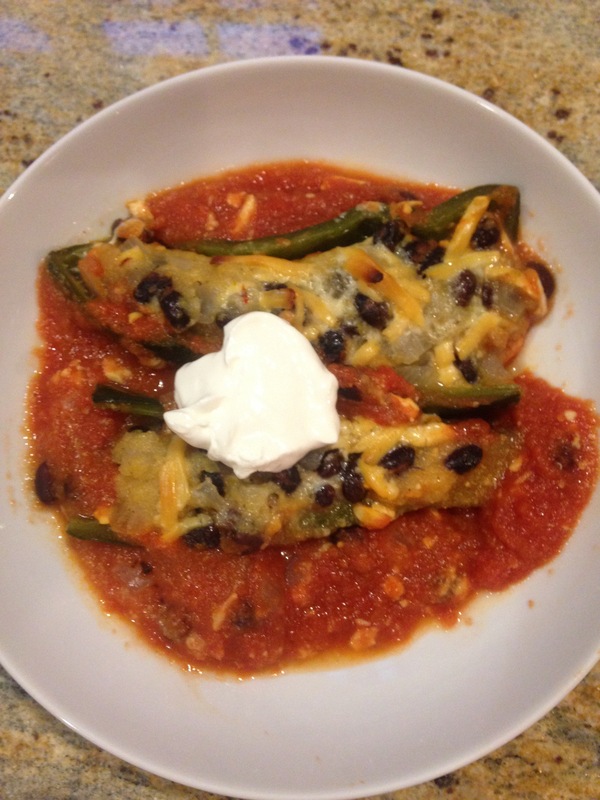 This is an easier, healthier take on chile rellenos but it has enough cheese to meet my “ooey-gooey quotient” What I love about this dish is what you don’t have to do. You don’t have to roast and peel the poblanos. While this certainly isn’t difficult, I find it tedious and wouldn’t bother doing it for a weeknight meal. The other thing you don’t need to do is batter and deep-fry the peppers as you would in a traditional chile relleno. This bakes right in the sauce which does not help its appearance any but certainly adds to its flavor. The recipe comes from Martha Stewart. Shockingly I think I’ve had this recipe for close to 10 years but I don’t recall ever making it. It makes me sad to think that this fabulous, relatively easy, surprisingly healthy (despite how it looks) recipe has been languishing away in the back corner of my recipe binder waiting for a day to impress. Well, these poblanos had their day in the spotlight and boy, did they shine! In a medium bowl, combine beans, cornmeal, 1/2 cup cheese, remaining onions, minced garlic, cumin and 3/4 cup water; season with salt and pepper. I’ve been getting a bit “fussy” lately with my cooking. Lots of ingredients, some of them a bit hard to find or not things you normally have lying around. I was thinking it was definitely time to dial it back and keep it simple. That, in my opinion, is best done with two things: steaks and pasta. 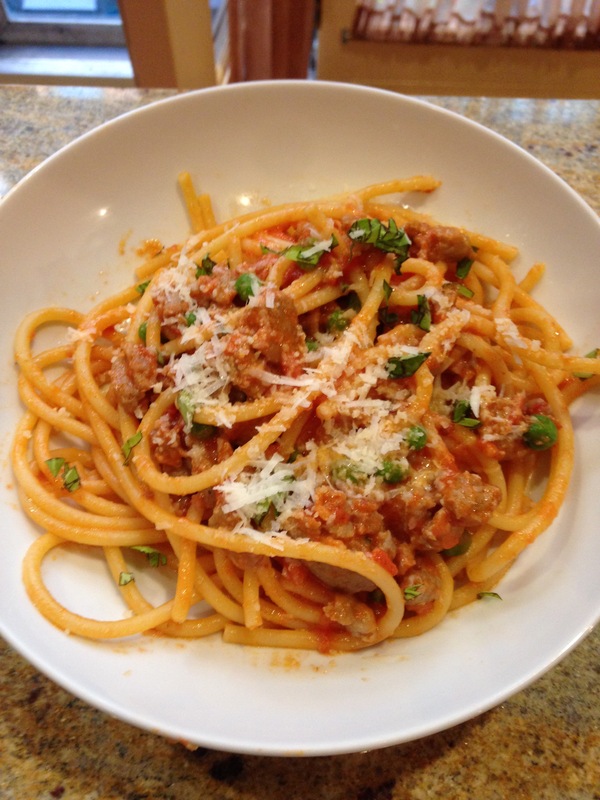 As it was Friday night which means a pre-run pasta dinner for hubby, I went for an old favorite: Bucatini with Sausage and Peas. The title just about gives you all the ingredients. It is sensationally simple and stupidly delicious. The recipe comes from Food & Wine Magazine and I’ve been making this for years. I can’t believe I haven’t mentioned it here in the blog before and I also can’t believe its been so long since I’ve made it. Lucky for me (and hubby) I made a double batch and froze half. We’ll be enjoying this stunner of a dish again soon. Meanwhile, cook the pasta in boiling salted water until al dente. Drain and return the pasta to the pot. Add the tomato sauce and 1/4 cup of the grated Parmigiano-Reggiano cheese and toss over low heat until the pasta absorbs some of the sauce. Transfer the pasta to bowls, top with the remaining 1/4 cup cheese and the shredded basil and serve.